The NP-95 battery for the Fuji X100 is good for about 200-300 photos depending on whether you use the LCD or chimp your photos frequently by previewing the LCD. Those who utilize all the power-saving options and stay away from the LCD might be able to push 500 photos under ideal conditions. Therefore, a spare battery for the Fuji X100 is a must-have, but paying almost 10% of the price of the camera ($90) for an FujiFilm OEM NP-95 battery is not reasonable for me. Unbranded. Do you really want to buy batteries from a nameless brand where there is no liability if something goes wrong? Power rating (mAh) is incorrect, usually too high. 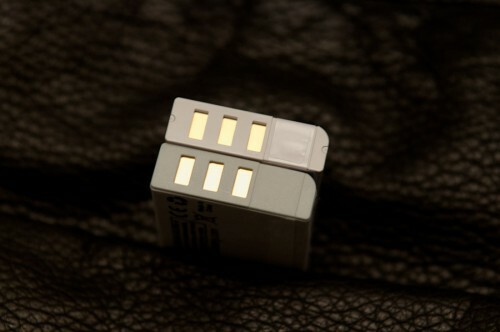 Batteries are wrapped in a flexible plastic sticker, rather than a hard plastic shell. Batteries overheat during use and expand inside the camera. This could make it get stuck inside the camera and cannot be removed when expanded. Batteries overheat, leak or explode during charge due to lack overcharge prevention circuitry. Batteries are smaller than OEM specifications so they can bounce around inside the camera or won’t charge due to poor contact with the OEM charger. Unfortunately for Canadians, the Maximal Power batteries have been sold out by Amazon for months; the Wasabi and SterlingTEK batteries are not available in Canada at all. In searching for an alternative, I found a Canadian distributor on eBay and Amazon selling UpStart Batteries (yes, they also ship international, including the US). The seller and UpStart Battery’s website both claim that these batteries are manufactured in the same factory where the OEM batteries are made. In addition, the company also offers a lifetime warranty for peace of mind. So I took a chance and ordered two NP-95 batteries from the seller’s (bifficus) eBay auction for an inexpensive price of $9 a piece. The shipment arrived within 4 days of paying for them. 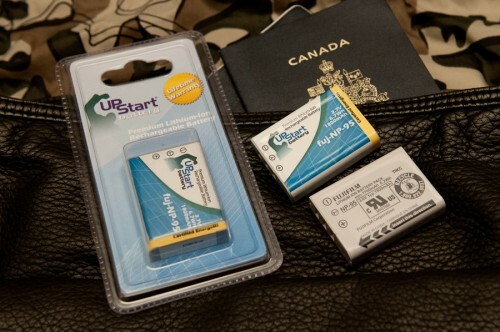 The clamshell plastic packaging means that UpStart Batteries uses a more expensive packaging process instead of simply wrapping them in a Ziploc bag or a cardboard box. The clamshell helps protect the battery really nicely and comes with good quality marketing materials. 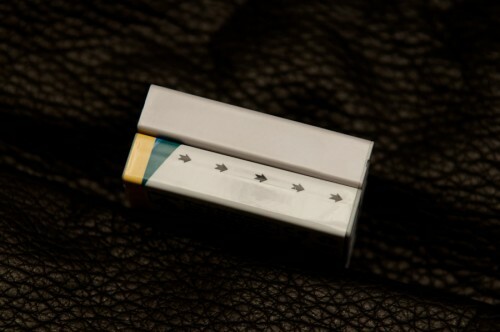 Though the packaging is not as important as the performance of the battery itself, the fact that effort was put into packaging and marketing is a good sign for the product. When compared side-by-side with the OEM Fuji NP-95 battery, you can see that it is the same size and dimension as the original NP-95. In fact, the plastic shell is 99% identical. The most important thing is that it fits inside the camera identically as the OEM battery and it also sits in the OEM charger perfectly. Therefore, the battery was designed and manufactured to OEM specifications from my visual perspective. Obviously the battery works in the camera without any issues, or I wouldn’t be posting this positive review. I take comfort in seeing that the website and the packaging are signs of a good quality product. For $9 a battery, there is certainly no harm in giving this brand a chance. 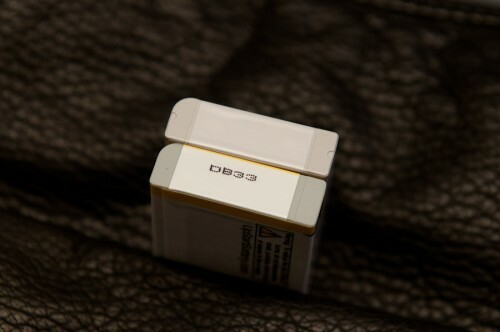 By the way, the NP-95 battery is identical in specifications and dimensions to the DB-90 batteries used for Ricoh’s GXR camera. Hi, I noticed you posted this about a year ago. How has the batteries lasted in the long run? Good question and I’m glad you asked. 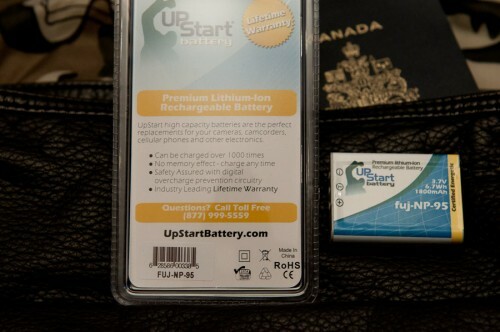 I have been using these batteries exclusively for all my photography and trust them 100% on my vacations. 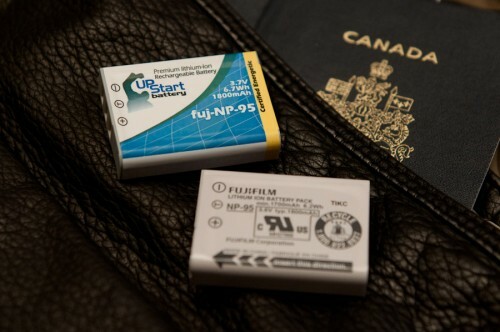 I have taken over 15,000 photos with the Fuji X100 mostly with these batteries. Needless to say, I endorse them for how affordable they are. Hope that helps. Upstart battery for Tomtom One GPS. Garbage.. Gave two for abourt $14. Don’t charge in car or using an in home charger. Contacted the customer support who promised replacements but have never delivered. Don’t Buy em. Sorry to hear that Brad. For just $9, it is still worth the risk over a $70 factory original battery. I just found these batteries at Amazon for a good price. I ordered for for use in my X100S. Sadly only two fit in the camera. The other two are “too fat” to fit in the battery compartment. I had the same issue from SterlingTek (STK); but that was only 1 out of 4 that I received. I wonder about these third party batteries and have a general distrust for them right now.